The gallery Atelierspuren is presenting from June 14th until July 11th a number of important modern pop art representatives from the US, Netherlands and Germany. 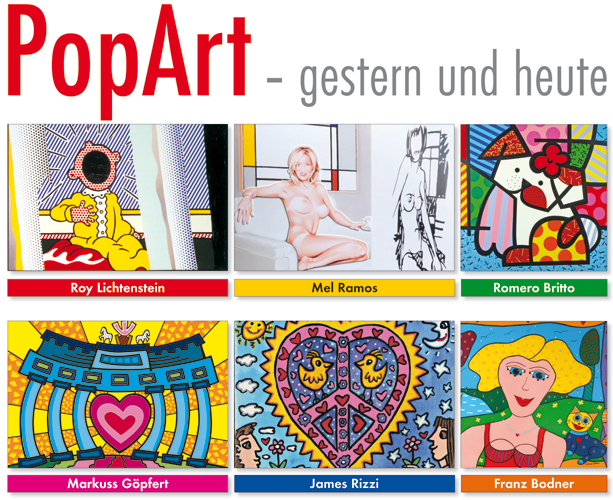 Collector´s piece of Roy Lichtenstein, Pin-Up-Girls of Mel Ramos, famous 3D-art works of James Rizzi, silk prints of Romero Britto and originals of Franz Bodner and Markuss Göpfert. The opening will be on Saturday 14th and Sunday 15th from 11a.m. until 5p.m. 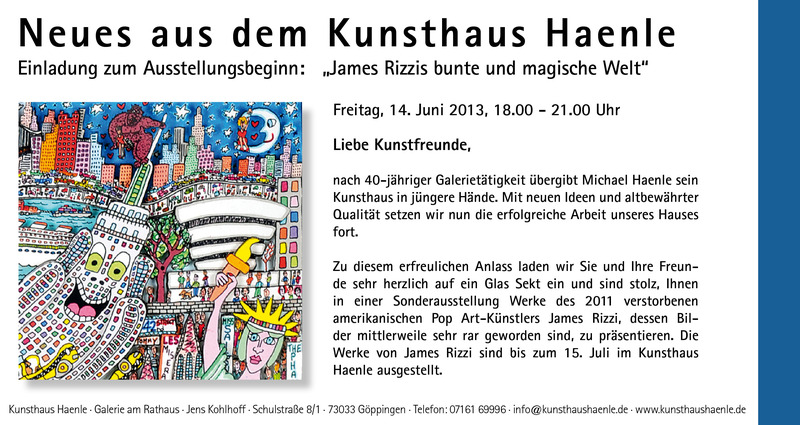 Exhibition „James Rizzi“ at the Culture Club „Ballenlager“ in Greven. 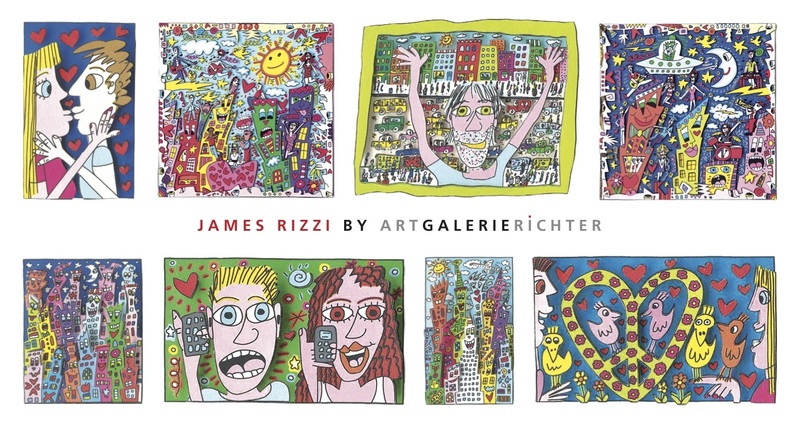 The New York artist James Rizzi was one of the most popular artist of the past decades. With his colorful 3-D paper constructions he intrigued people of all ages around the world. 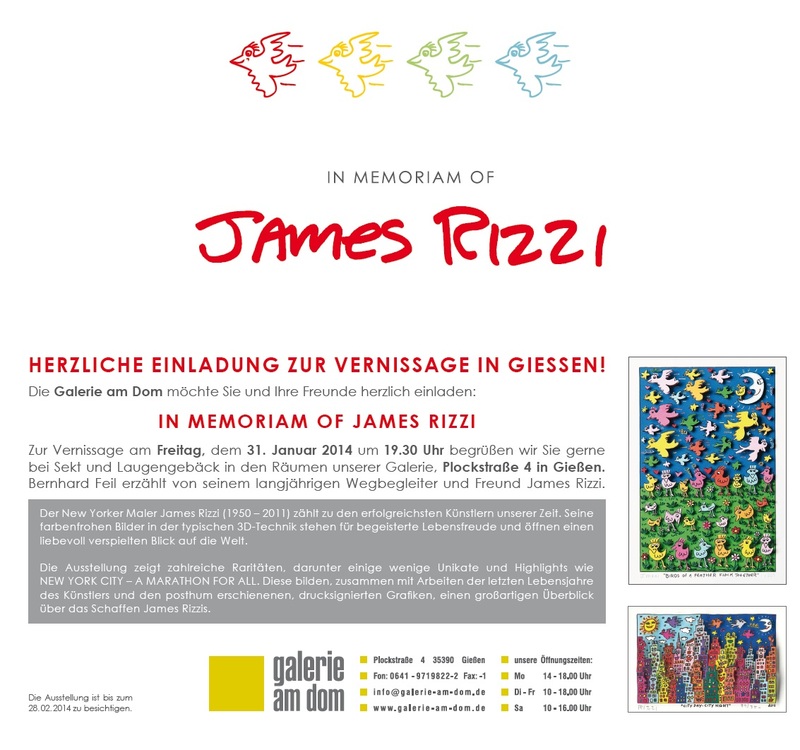 Galerie Hunold cordially invites you to the opening of the show „James Rizzi“ presenting an overview of Rizzi’s paintings and 3-D constructions. 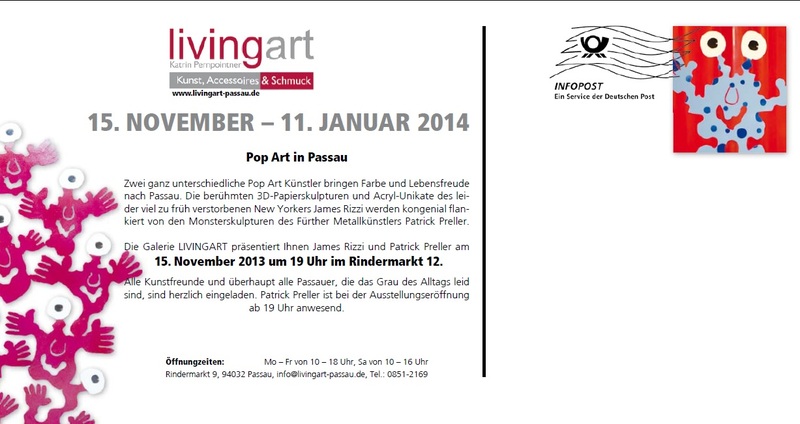 INVITATION TO THE OPENING IN GIESSEN! 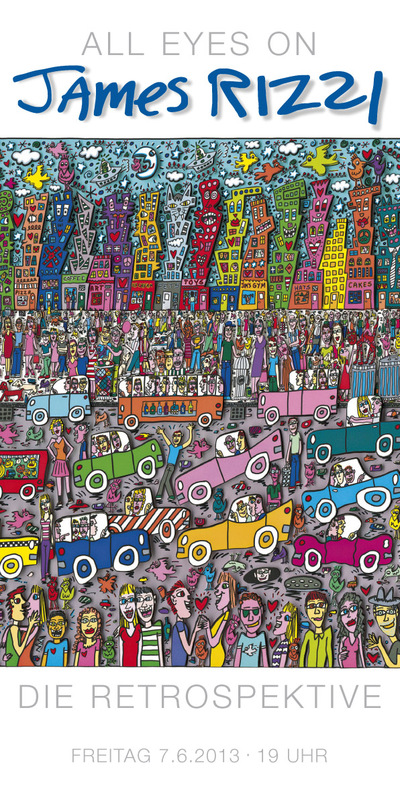 The New Yorker painter James Rizzi (1950 – 2011) is one of the most succesful and famous artist in our times. The colourfull and tipical 3D technique stands for joy, vitality and a positiv point of view. Die Ausstellung zeigt zahlreiche Raritäten, darunter einige wenige Unikate und Highlights wie NEW YORK CITY – A MARATHON FOR ALL. Diese bilden, zusammen mit Arbeiten der letzten Lebensjahre des Künstlers und den posthum erschienenen, drucksignierten Grafiken, einen großartigen Überblick über das Schaffen James Rizzis. 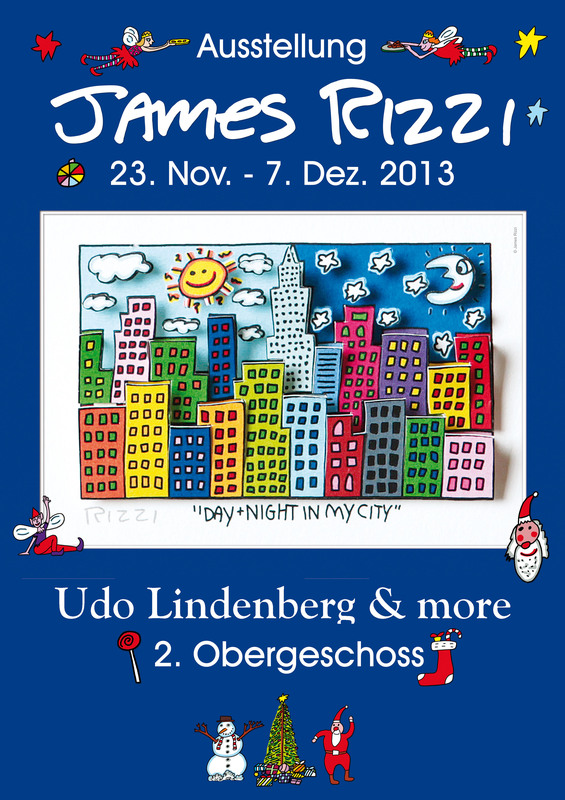 An annual Christmas presentation of James Rizzi takes place in the Udo Lindenberg Galerie in Hamburg. This year not only the famous 3D constructions are presented. Also a very special piece of James is available in the gallery. The art work “My kind of Hamburg” has been developed by James Rizzi during his lifetime and will be shown on the opening day on November 23rd from 10a.m. until 8p.m. in the gallery in the Europapassage. The special limited edition only available in Hamburg. James Rizzis Pop Art is unforgotten. Wir feiern seine einzigartige, lebensfrohe Kunst in einer großen Retrospektive und freuen uns ganz besonders auf diese außergewöhnlich breite Palette seiner Werke. Neben den sehr begehrten und ganz seltenen 3D-Collagen und Unikaten auf Leinwand und Papier aus verschiedenen Schaffensperioden zeigen wir die neuesten Arbeiten des Künstlers. Zu Lebzeiten schuf Rizzi eine ganze Reihe Bilder, deren Fertigung er nicht zu Ende bringen konnte und die nun postmortem mit einer Nachlasssignatur erschienen. Einige davon feiern an dem Abend ihre Premiere! Rizzis wunderbare Kunst lebt weiter! 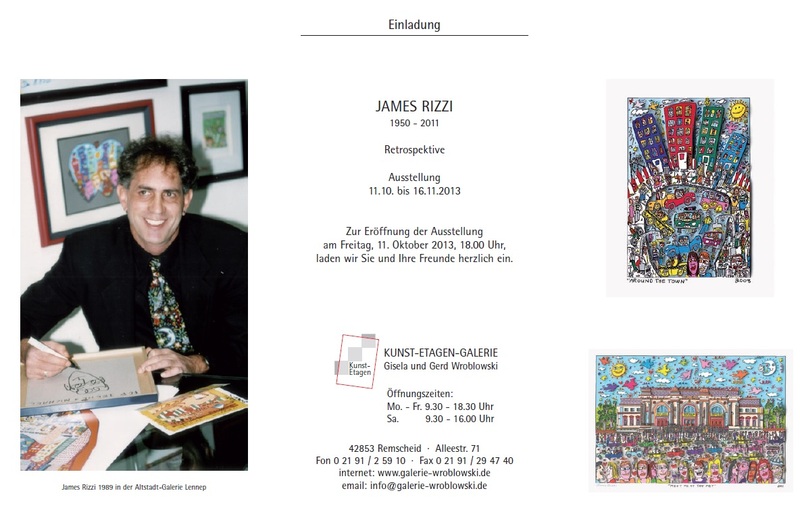 In the bavarian city of Weiden, in the Gallery Recknagel, for the very first time art works of James Rizzi can be seen. The exhibition will be in the Atelier in the centre of Weiden. You are welcome to visit the opening and the afterwork party on November 07th at 7p.m.. The taste of art until midnight is the theme of the evening. The gallery team will present you originals and brand new 3D art works. Two Pop Art artist bring joy and color to the city of Passau. The famous 3D-sculptures and originals of the New Yorker James Rizzi are combined with metal sculptures of the artist Patrick Preller from the Bavarian city of Fürth. James Rizzis died too early. A dedication to his work will be an exhibition in the gallery Living Art in Passau. The gallery present in this fantastic combination the modern Pop Art wave. On November 15th all fans and art lovers are invited to see the colourful art works. Patrick Preller will attend the opening at 7p.m. In the Gallery Kunstetagen Wroblowski visitors can see from October 11th until November 16th art works of the artist James Rizzi. New post memoriam 3D constructions, as well as etchings, sketchings and works from the early periode are exhibit. The opening takes place on October 11th 6p.m. 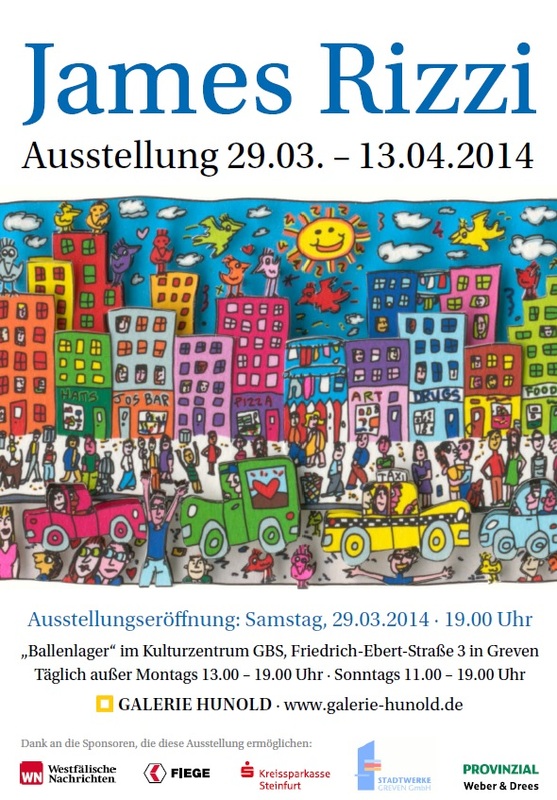 You are invited cordially in the Kunstetagen to admire and buy colourful art of James Rizzi. After 40 years working in the art business the gallery will have now a new owner Jens Kohlhoff. The new start of the gallery will be celebrated on June 14th with a extraordinary exhibition of James Rizzi. Until July 15th you are able to see very special paintigs and art works. The opening will be on June 14th at 6 p.m.! Collectors and guests are welcome in the gallery. Sie sind Rizzi-Fan und lieben seine Arbeiten? 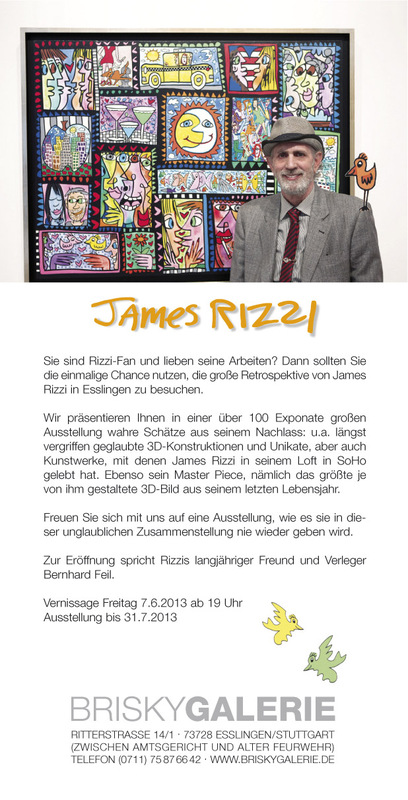 Dann sollten Sie die einmalige Chance nutzen, die große Retrospektive von James Rizzi in Esslingen zu besuchen. Wir präsentieren Ihnen in einer über 100 Exponate großen Ausstellung wahre Schätze aus seinem Nachlass: u.a. längst vergriffen geglaubte 3D-Konstruktionen und Unikate, aber auch Kunstwerke, mit denen James Rizzi in seinem Loft in SoHo gelebt hat. Ebenso sein Master Piece, nämlich das größte je von ihm gestaltete 3D-Bild aus seinem letzten Lebensjahr. Freuen Sie sich mit uns auf eine Ausstellung, wie es sie in dieser unglaublichen Zusammenstellung nie wieder geben wird.